"This book is billed as the other side of the Braveheart movie but it is a lot more accurate even though it is historical fiction and some of the main characters didn't really exist." "This is a rollicking good historical tale with knights, battles and a beautiful young maiden"
"A great first novel from this new writer"
"The Poisoned Cup was an absolute gem of a find and I was stunned to discover that this was a debut novel." "The writing is truly impressive and readers who are familiar with the brilliant works of Maurice Druon may find similar writing style with the use of dialogue, delivery of historical events and overall pacing of the story." 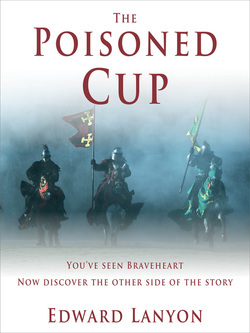 The Poisoned Cup is pure historical fiction. If you enjoy Bernard Cornwell’s historical tales, you’ll enjoy this one. It is also an attempt to give the reader a different perspective on the Anglo-Scottish wars to the one portrayed in the Braveheart film. I suppose it began from the point where I had read Marc Morris’s book, A Great and Terrible King, around the same time I saw the Braveheart film on my television. Morris’s biography of King Edward told a somewhat different story to the film. I was intrigued enough to start my own research. The novel was a natural outcome. Sir Henry de Grenville. He’s an old man drawn into a conflict he would rather avoid. All he wants is to settle down peacefully and see out his remaining days on his estates in Wiltshire. But he’s ordered north to take part in the war. He has a wife who nags him because she loves him dearly and worries about him. They’re a perfect pair. I was working on my own analysis of why King Edward got caught up in the Scottish crisis, and I wondered if he had any idea of the consequences of his involvement. Did he realise, I wondered, that he was being offered a poisoned cup. Because that’s what it turned out to be. It depends what you mean by difficult. I actually enjoyed writing this book. I enjoyed the vast amount of research I had to undertake, and I enjoyed creating the plot and the characters. I suppose the only hard bit was the amount of time I had to lock myself away from the real world outside my front door.